If you find your video corrupted it can be very annoying. In case of professional, it may mean financial loss or losing a customer. However, there are tools such as MP4 Video Repair Tool that can help you repair your videos within seconds. This wonderful software is designed to repair your videos with least effort. If your video files are corrupted or damaged, remember all you need to fix them is MP4 Video Repair Tool. It will give you the power to fix broken MOV files on Windows 7 8 vista XP and Windows server 2008 and 2003. So wait no more and fix your broken videos files now! MP4 Video Repair Tool allows you to fix your video files from a number of different storage devices such as USB, hard drives memory cards and more. So no matter where your file is all you need to do is to get this digital tool and repair your files without any problem. What is the size of your video that is corrupted? Well, there is no need to worry as MP4 Video Repair Tool can fix all MOV files regardless of their size. So when you get this tool to fix your video you need not worry about the file size at all. In addition to repairing corrupt MOV files, MP4 Video Repair Tool also fixes MP4 and MPEG files. So it makes a versatile tool for fixing any kind of video format. Users from around the world with different needs can thus easily benefit from this wonderful app. MP4 Video Repair Tool features a strong inbuilt algorithm. That is why it is able to fix your videos within no time. It basically works by checking and rejoining the corrupted tracks of video files. Then it efficiently fixes the entire file. MP4 Video Repair Tool proves to be useful when your video file is corrupted in case of virus attack, software conflicts, hardware failure or unexpected system shutdown. That is why no matter the cause of your video damage, this software can fix it all. Due to the user friendly interface of MP4 Video Repair Tool, it makes a great tool that helps you repair your videos with ease. Even if you are no tech geek you will be able to make the most of this tool without any issue. 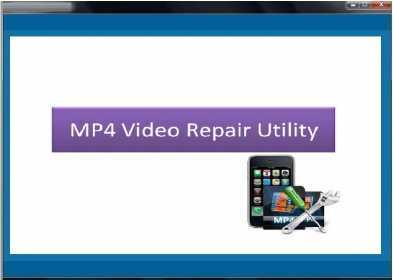 MP4 Video Repair Tool offers 24/7 customer support as well. If you face any issue with your video at any time or this software gives you any kind of trouble you can simply get in touch with the customer support and get immediate help instantly. So get MP4 Video Repair Tool and end all your worries related to your corrupt video files now! Your video files are got corrupteddamaged Your thinking how to fix all broken video files. Here we are introducing MP4 Video Repair Utility it is used to fix broken MOV files on Windows 7 8 vista XP and Windows server 2008 and 2003 from different kind of storage devices like hard drives memory cards and USB drives etc. This tool can support large sized damaged or corrupted MOV MP4 and MPEG files also. Repair MP4 files has a strong inbuilt algorithm which checks and rejoins the corrupted tracks of video files. Repair damaged MOV files software efficiently fix the entire file which have been damagedcorrupted in different situations like virus attack software conflicts hardware failure and unexpected system shutdown. It has a friendly user interface. Fix MOV repair software analyzed and certified by industry experts to repair video files. As we provide demo version of this MP4 Video Repair Utility users can preview repair corrupteddamaged video file before restoration and once satisfied then go for the full version. If you have any other issues regarding MP4 repair product you can contact our 24 * 7 free customer support team.